The In-Car Entertainment is becoming more sophisticated in modern cars today. You will get high quality audio and video entertainment in every car that rolls off the assembly line. Here is some stuff, which you can expect in the latest model cars. More than just speakers in the back or front. Surround sound systems will include speakers in the front, speakers in the back and subwoofers. They will be powered by MP3 player and external amplifiers. You will experience a true surround sound. 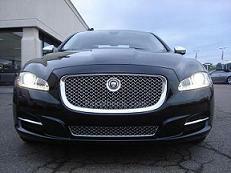 The biggest, most high tech sound technology you found at homes now resides inside your car. Dolby Digital 5.1 surround, Dolby Pro Logic surround … its all there now for your automobile. 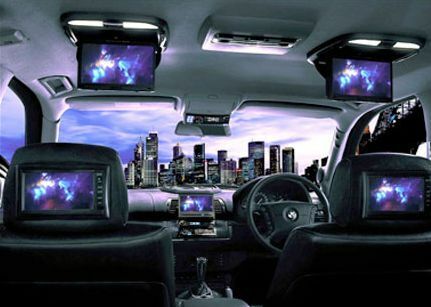 If surround sound isn’t good enough for you … how about we chuck in a DVD player and some video screens here and there inside your car … with multiple displays. All inside your car … a total theatre! Something you would wonder how to fit in a whole complete surround sound audio system inside a car, with video? So my friends yes, it is very possible, here have a look! Players, also known as head units, are the things that read your music from a certain source and feed it to the speakers. Tuner is the basic thing. A radio tuner actually starts the in-car real audio thing. Nowadays tuners come built-in with other types of players like the CD players etc. Cassette Player is one of the most used players for your cars. You get a single cassette player with a built-in radio tuner. This cassette player fits in front panel of your car generally 6×2 inches. A simple cassette player will handle up to 4 speakers, at the same time. CD Player: The poor record quality of cassettes led to the advent of CD players into cars. Improvements in technology now get you almost skip free CD’s … so the bumps and rumbles of a drive down a bad road do not affect the play. These CD players, which can play Audio CDs, are usually 2DIN and can play your CD’s as well as your cassettes. MP3 CD Players: The popularity of the MP3 (Mpeg-3) sound format has now hit the car’s audio department. They are the same as CD players but they are compatible with MP3 sound format. Some can also play WMA sound (Windows Media Audio). The small file size enables a single CD to contain over 200 songs of good quality. Also controllable via remote too these things are quite useful for transferring your whole audio collection right to your car. VCD players: VCD playing capability comes in some highend CD players. You will find VCD players both with and without MP3 capability, although all will play Audio CDs. DVD players are now available for your car. These players have Dolby Digital surround as standard so you get a might good theatre in your car. Some offer a slide out LCD of either 6.5 or 7 inches. Some are touch screen LCD’s and almost all can handle an externally attached LCD. 6×9 Co-axial speakers: These are the most popular speakers, which combine all ‘drivers’ of the speakers in one package. Almost all brands produce good sound at a cheap price. In a standard 6×9 speaker, a 6×9 inch woofer takes the whole place while a small tweeter is in the middle of it. Component Speakers: These speakers, as the name suggest have their drivers split apart i.e. each driver is a total different component of the whole package. These speakers produce sound of higher quality but also a good pair will cost you almost twice the double as a good pair of 6×9 speakers. A standard component package contains 3 parts. 3. A Crossover for attaching the above two through wiring. Round co-axial: these are very small speakers … and you would find anything satisfying your sound needs. They come preinstalled in almost all cars … mostly in the doors. Buying one isn’t worth it as you can get 6×9’s very cheap from the market. These additions power up your speakers so they can really produce the sound volume they are capable of. A simple head unit simply cannot drive speakers to the maximum and rarely can even make a subwoofer move its cone. Amplifiers come in various channels and with gain controls, crossover control and bass boost. Most are 2-ohm stable when bridged. This means that in bridge mode and in 2-Ohm mode … they put out a lot of power … needed for subwoofers! Amplifiers are wired by RC cables, so make sure you have them in your head unit. The Equalizers are more or less like home equalizers that controls gain for frequencies … and you can increase and decrease on your wish. CD changers are added to compatible cassette or CD head units and controlled from them. Most CD changers have 12 disc cartridges, although now you can get higher ones easily. Hi-end models have remotes too. FM modulator CD changers, which are controlled using a separate controller to change tracks, transmit the signal over the FM frequency so you can use your CD changer. You can add as many as you like to be honest. Just need some adapters so you can have multiple screens. You can mount them in the headrest … in the front or on the roof. When I said what’s in your home is now in your car, I meant it. A simple adapter and a couple of wires here and there and you get Playstation in your car. Good thing if you have kids and would rather hear the soundtracks of a game accompanied by sound effects rather than their whining.